Please read the following prior to downloading this application! held liable or responsible for any computer or software related issues that may or may not be due to the actions of the MWI representative. related to the troubleshooting of a problem with the MWI product in question. save the application, but will run it once it has downloaded. browser being used. If not, use file explorer to navigate to the downloads folder, and then run the “MWI-QuickSupport.exe” file. 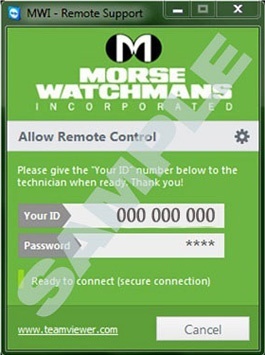 Quick Support application is running, please give the technician the “Your ID” number listed to begin the remote support session.